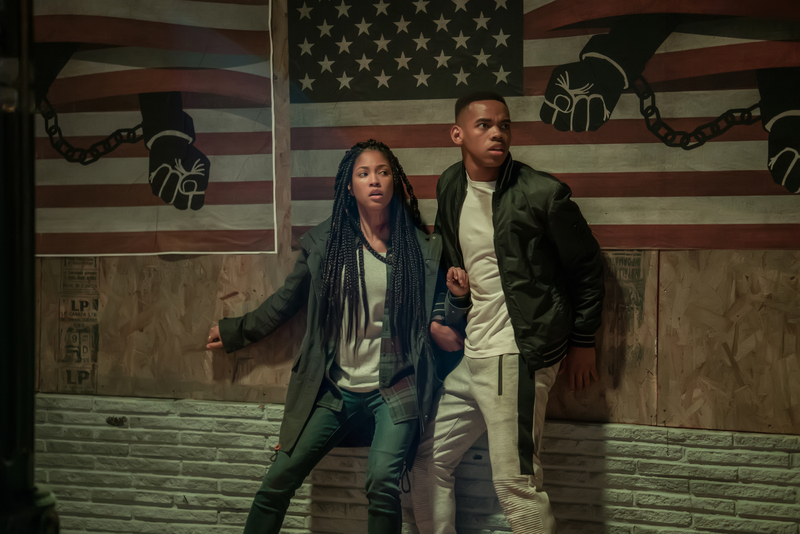 British Actor Joivan Wade stars as Isaiah in the 4th instalment of Hollywood franchise The First Purge set in a future dystopian America where for one day of the year for 12 hours all crime is made legal, including murder. This is an experiment launched by the NFFA (New Founding Fathers of America) to see if it is what America needs. The three movies before The First Purge are: The Purge (2013), The Purge: Anarchy (2014) and The Purge: Election Year (2016). The First Purge as entitled is a prequel, exploring the events that led to the creation of the deadly yearly 12-hour crime spree. The film opens with the character Sketolor, close-up, a face full of deep embedded tribal scars, eyes popping, resembling a heroin hooked zombie like creature being asked “who is he angry at”, and he is angry at “everything, everyone”, this is followed by the President addressing the nation about the “death of the American dream “and the nation needing to “dream again”. Is this Trump’s America? It is not ironic that when the “lab rats” (people of Staten Island) do not fully participant and are instead having block parties the NFFA attempt to heighten the action by bringing in their own soldiers to determine the success of the experiment, hence the sinister intentions of the NFFA are revealed “to purge” America of the unwanted. One cannot ignore that this is a mainstream film with a predominately black cast, set in the projects of Staten island, amongst a poor black underclass. The experiment is spearheaded by Dr Updale (MARISA TOMEI), her last attempt at securing her legacy. The last half of the film sees impressive fight scenes and action, a Rambo meets Die Hard moment when drug-lord Dmitri (Y’LAN NOEL) turns superhero when he discovers the NFFA’s “cultural study”. With the support of community activist Nya (LEX SCOTT DAVIS of SuperFly) and her younger brother, Isaiah (JOIVAN WADE of Doctor Who) — they take to the streets to protect their people, and what’s left of their country’s humanity, at all costs. British actor Wade (Isaiah) does not drop his flawless performance, taking on a convincing American accent. Political commentary drives the action evidently seen in a church shooting where members of the community who did not want to purge take refuge only to be “taken out” by the NFFA men. The masked and hooded men fly the confederate flag as they seek out their targets in the projects. A statement of race in America perhaps? Taking us back to the Charleston church shooting in June 2015. The movie has some great elements of suspense and terror keeping you at the edge of your seat. Overall a chillingly telling narrative that makes you want to remind yourself this is not real-life if it was not for the current political climate in America where there is a of growth disenfranchised groups each fighting to protect a cause, with an overarching enemy who is driven by old values of making America great again.